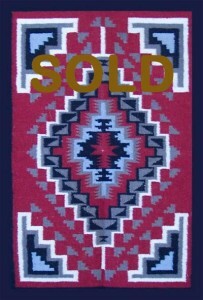 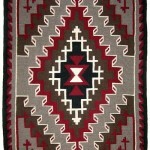 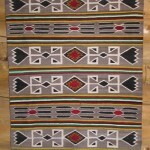 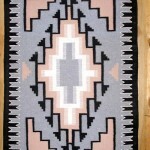 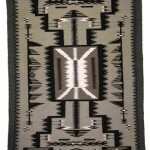 This Indian rug replicates the classic Ganado Navajo rug, employing traditional Ganado rug colors: red, black, gray and white, and the typical border of black or red. 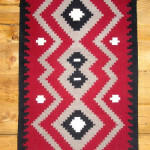 An uncomplicated geometric design theme dominated by the serrate, or stair-stepped diamond, on a beautifully dark red background, characterizes a Ganado rug. 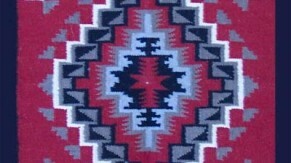 In some pieces one diamond is drawn out from end to end; in others, three adjoining or interlocking diamonds fill most of the space.